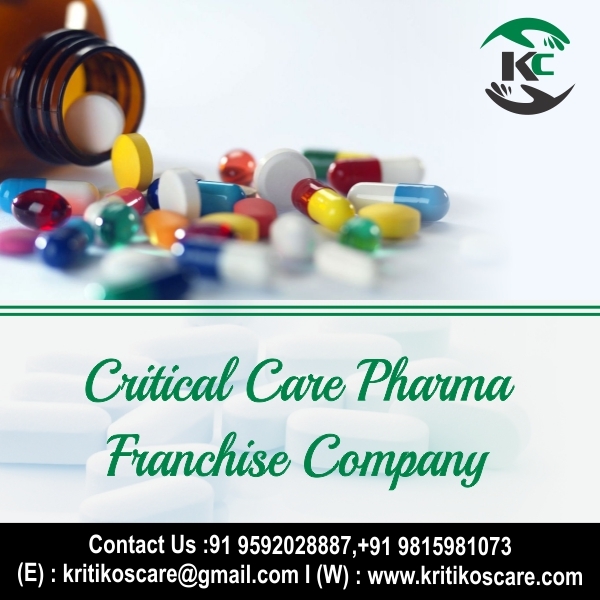 Critical Care Franchise Company in Gujarat- Kritikos Care is a growing critical care medicine franchise company in India. Here at Kritikos Care we always believe that the outcome of great partnerships is big business. For the same reason, we place a high value on each client and their needs and work tirelessly to build a good relationship with each of them. Our Critical Care Franchise Company in Gujarat applies, in addition to the business motto, a passionate approach to improving Indians’ lifestyle by bringing the best quality critical medicines and therapies at the most reasonable cost. Critical healthcare conditions are always a concern for every individual. Because it put the major impact on the death rate population. The demand for the Critical Care/Intensive care medicine in the pharma sector like hospitals and healthcare centers is always high as because these critical care medicine helps to save someone’s life. Our purpose is to reach in every corner of India, so to deliver Intensive care medicine to the unmet needy individual. Therefore after Kritikos Care establish ourselves in Panchkula, Haryana and other northern regions of India, we introduce our Critical Care Franchise Company in Gujarat. Kritikos Care welcomes medical professionals to become our franchise business partners. To know more regarding the opportunity and other business related queries you can contact us at +91-9592028887, 9815981073. Even you can share your views, feedback, and suggestions by writing to us on kritikoscare@gmail.com. Kritikos Care is led by a player of outstanding specialists who contribute significantly to our success with their expertise in their field. The leadership team maximizes our customers ‘ value through good corporate governance based on trust and transparency foundations. The strengths of Kritikos Care are professional manpower, various product ranges, and strict quality control. With established timelines, we have the ability to deliver a quality product without compromising the quality. You can trust us for our genuine work and quality products and services that make us Critical Care PCD Pharma Franchise company in Gujarat. Our pharma PCD company for critical care medicine has all the facilities that make our every manufactured product more valuable. There is a separate department of quality that helps us flawlessly deliver all the medicines. In this department, we have maintained a certain quality standard, where multiple regulatory authorities approve all measurements. Our hired quality inspectors are also very prominent in the efficient execution of their work. They mastered making sure all the ranges of medicines are error-free. Special market demand for Critical Care Medicines/ Drugs. These Intensive care drugs are useful for treating patients who are critically ill or those with life-threatening severe diseases. Critical care market growth is expected to increase over the time forecast. At Kritikos Care, we are constantly seeking to expand our presence and build a strong network across the country. Our position in Gujarat is at top Pharma Franchise company. We are offering a wide range of critical care products of the highest quality. We expanded our business presence through genuine pharmaceutical marketing services in uncovered areas. For effective, durable and safe results, you can trust our quality formulation. Kritikos Care provides the best backup support to ensure our business partners’ growth and success. A wide range of critical care medicine. Best prices for all intensive care products. Attractive and innovative advertising tools. Quick order dispatch and prompt the best customer support. At Kritikos Care, we built a sophisticated on-site infrastructure facility that is fully integrated with the state-of-the-art machinery and technology. Our infrastructure helps us deliver our esteemed customers with a variety of drug range. All assigned members are responsible for formulating the variety of drug range in this department. To develop each drug range, they make use of the rich resource and pure chemical extract.